Industrial Grade Shade. Ultra Wide Value! 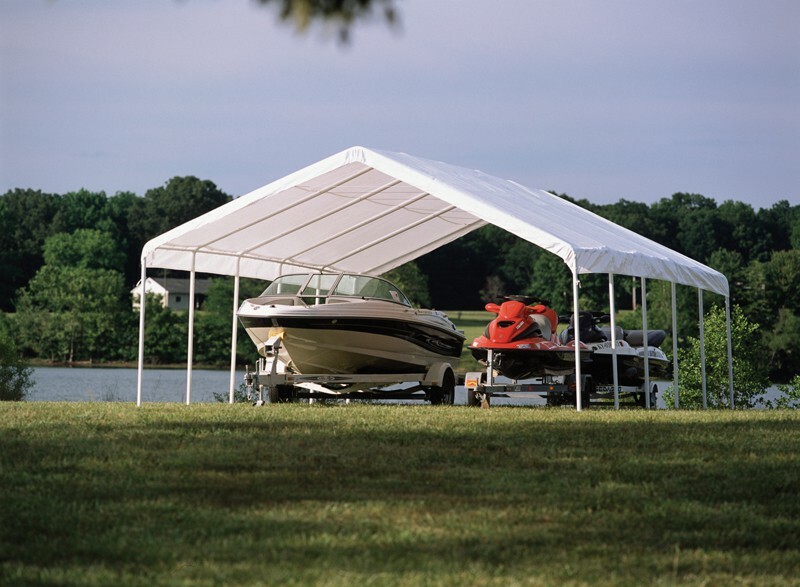 The ultra wide SUPER MAX Canopy is the perfect seasonal storage or event solution. Starting with high grade steel, every frame pipe and connector is subjected to a proprietary 13 step Rhino Shield steel surface preparation process. Professional grade 2" outside diameter all steel frame, bonded with Dupont thermoset baked on powder-coated finish prevents chipping, peeling, rust and corrosion. Advanced engineered, triple-layer, chemically heat bonded enhanced quality weave, polyethylene fabric is rip-stop and 100% waterproof cover. UV-treated inside and out with added fade blockers, anti-aging and anti-fungal agents. Fitted, fully valanced cover. Rock solid design assembles quick and easy with slip together swedged tubing. Patented Twist Tite tensioning squares up frames and tightens down covers for a clean and finished look. 2" diameter powder-coated structural tubing with white powder-coated finish. Slip-fit connections for easy assembly. Side Leg Height to Valance: 6'3"
- (1) 18' x 30' 2" Powder-coated steel frame. - (1) UV-protected, polyethylene cover. - 1 Box, Total weight: 280 lbs.